The Korean World Amateur Championships, also known as the Korean Prime Minister's Cup (KPMC), will take place from 3-9 September in Buan County this year. To determine the Dutch representative for the KPMC a knock-out tournament was played on the 2nd of July in the European Go Cultural Center in Amstelveen, the Netherlands. Eight players participated, who had qualified for the preliminaries of the Dutch Championships or for the Dutch Championships themselves. The first round of the knock-out saw two upsets. Filip Vanderstappen 5d - recent winner of the Utrecht tournament - and Frank Janssen 6d were eliminated by Kim Ouweleen 4d and Herman Hiddema 4d respectively. Hiddema's game against Janssen was especially remarkable, with a sharp fight in early fuseki - perhaps slightly underestimated by Janssen - that echoed throughout the entire middle game. When the smoke had cleared, Janssen was too far behind on territory and resigned. In the semi-finals Kim Ouweleen played Dutch champion Merlijn Kuin 6d and Herman Hiddema tested his fighting spirit on Geert Groenen, the 6dan player with the most difficult Dutch name for foreigners to pronounce. Ouweleen took a big risk in his opening against Kuin, taking clear profit in one area of the board, but leaving a weak group unprotected in another. Could his group be surrounded with one move? The time setting of 40 minutes per person was in Ouweleen's favor, who left a difficult position for his opponent to calculate. Kuin decided not to go for the kill and pressured the group from a distance, which resulted in big dragons chasing each other, efforts to create weaknesses in each other's positions and the eminent struggle for sente. As often is the case in middle game, the stronger player takes control and Merlijn Kuin turned the game to his hand. A couple of blunders from both players in byo-yomi added to the excitement, but they did not help Ouweleen, who resigned. In the meanwhile Hiddema had already given up against Groenen. He had brought the same fighting spirit to the table as in his previous match, but perhaps slightly overdid it against Groenen, who calmly dodged the punches and turned his opponent's position sour. At move 151 Groenen captured a big corner and won by resignation. The final was decided: Geert Groenen was to play Merlijn Kuin. Even though Groenen, as Kuin remarked upon during the game, "had in the opening already played five moves on the second line", his start was promising. At move 28 however, Groenen invaded too early in what seemed to be a less important side of the board and Kuin managed to start a fight in his favor. After the opening struggles, Groenen had to find a way to reduce the big moyo of his opponent and resorted to a do or die move. Kuin's moyo shrunk, but so did Groenen's own territory in return. 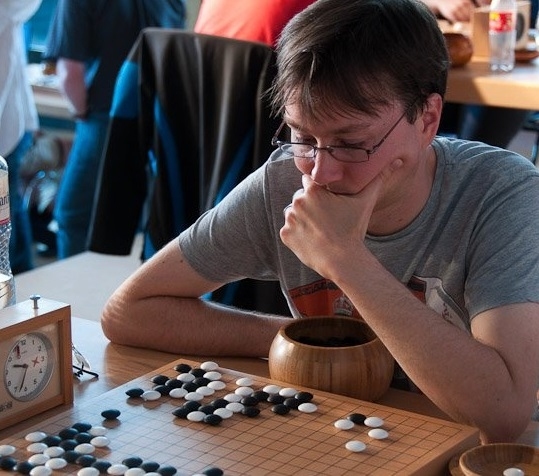 In the end, Merlijn Kuin managed to cut off a group at the top of the board, which ensured his victory and the qualification for his fourth Korean Amateur World Championships.